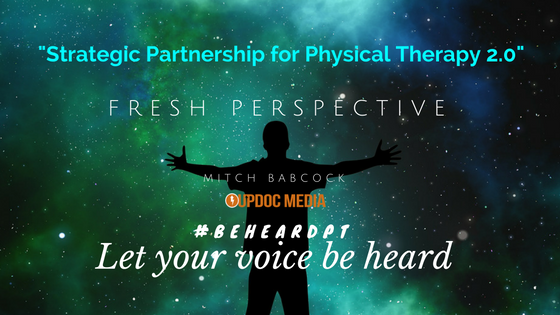 Today’s Fresh Perspective comes from newly graduated Doctor of Physical Therapy, Mitch Babcock! There is a revolution happening in physical therapy. Physical Therapy Version 2.0, as coined by our friend Dr. Jeff Moore, is growing and quickly separating itself from physical therapy of the past. A stronger emphasis on evidence based practice and outcomes in a primary healthcare setting, the use of active interventions over passive modalities, and better use of strength training principles and loading over light thera-band and long arc quads. Our profession is also recognizing the unique position we have against the national opioid epidemic, with physical therapy as a more effective and much safer alternative for pain management & reduction, as backed recently by the CDC. Mike Eisenhart is making significant efforts to bring to light the impact the physical therapy profession can have on chronic disease & population health, as well as a number of other great clinicians all over the country quietly working for change in their respective communities. Consistent and frequent physical activity continues to be shown as the secret ingredient in battling a number of health and orthopedic issues plaguing our country, and physical therapists are working to create innovative ways to integrate with the community and push this uniform message. There’s another organization pushing an almost identical agenda for population health. They use frequent exercise and sound nutritional principles to make significant changes in their clients’ health. They bring members together for concise 45-60 minute fitness classes 4-6 times per week, teaching movement skill fundamentals and using high intensity workouts for an effective and efficient metabolic response under time constraints. They have over 13,000 locations worldwide and growing, all sharing a uniform message — making significant changes in millions of peoples’ lives through fitness. They’re called CrossFit, and there’s a good chance there’s one in your town. CrossFit has received a mixed rap from the healthcare community in previous years, scoffed as ‘job security’ by many due to an increase in orthopedic injuries attributed to the training program. In years prior, when patients sought out for physical therapy services with an injury while doing CrossFit, some clinicians made huge mistakes by advising them to ‘stop doing CrossFit’. They failed to realize the magnitude behind this statement, as it has since left many in the CrossFit community turned off from seeing any healthcare provider that does not do CrossFit for fear that their lack of understanding will result in misdirected advice. Anecdotally, I’ve seen and heard this sentiment first hand at multiple CrossFit boxes and with numerous athletes. In a day when chronic disease is attributing to an estimated 70% of all deaths and billions in US healthcare expenditure annually, it will take an army of well-informed individuals sharing a unified message in every community to shift the tide. Rather than wasting time arguing about coaching philosophies and orthopedic injury rates, joining forces with your neighborhood CrossFit can make for a great strategic partnership to move the needle against chronic disease and improve health metrics of our country. As physical therapists, our skills are exactly what the CrossFit communities needs to assist in the greater mission of keeping people moving and training over a lifespan. I urge physical therapists to become educated about CrossFit, the training philosophy, the community, and the greater vision of founder Greg Glassman and CrossFit HQ. Having recently obtained my CrossFit Level I Trainer certification, the depth and breadth of material covered and fundamental movement education is top notch for a weekend course. For therapists looking to supplement their knowledge in strength & conditioning movements, understanding the CrossFit philosophy, and CrossFit nutrition principles, I would strongly recommend attending a course. Reach out to your local affiliate and see if you can observe a few classes or, better yet, join in and experience it first hand. With an objective and open mind, I believe we’ll find more similarities than differences. A mutual understanding and partnership could be exponentially more powerful in our communities than attempting to go at this problem alone. Mitch Babcock is a recent graduate #FreshPT from the University of Michigan. With a interest for health and fitness that began early in school, Mitch obtained his undergraduate degree in exercise science from Saginaw Valley State University before pursing graduate school for physical therapy to gain a deeper understanding of the human movement system & to have a greater impact on people in their pursuit of health. 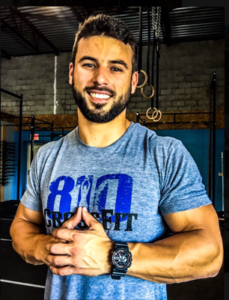 Mitch is certified in the SFMA, FMS, RockTape Level II, as well as his CrossFit Level I. Connect with Mitch on Twitter @Babcock_DPT or Instagram @UnchainedPhysio.